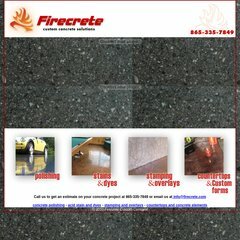 Topics: Concrete Polishing, Acid Stain And Dyes, Stamping And Overlays, and Countertops And Concrete Elements. Godaddy.com Inc (Arizona, Scottsdale) is the location of the Microsoft-IIS/6 server. It is written for ASP.NET language. Its 2 nameservers are ns31.domaincontrol.com, and ns32.domaincontrol.com. PING (72.167.131.137) 56(84) bytes of data.